An article in the Los Angeles Times with the headline Congress quietly ends federal government’s ban on medical marijuana. An article in Alaska Dispatch News with the headline President Obama declares waters in and near Bristol Bay off limits to oil and gas leasing. And perhaps most significantly the story in The New York Times U.S. to Restore Full Relations With Cuba, Erasing a Last Trace of Cold War Hostility. Of course there will be nay-sayers but I welcome all these developments and hope that there is more good news to come this festive season. I am fifty years old and have never been a member of any political party, but with the media gearing up for a General Election in May next year I have more or less made up my mind to join the Green Party. Although in theory we will be voting for individuals, the vast majority of votes cast will be for people standing as official candidates for one of a small number of dominant political parties and the whole thing will be presented as a battle for votes between these parties. One of the key elements in the battle will be a number of televised debates, and between themselves the main broadcasters have decided to limit participation to just four political parties. They were bound to include the Conservative Party and the Labour Party, and I guess they thought they would have to include the Liberal Democrats despite their huge loss of support since forming a governing coalition with the Conservative Party. What seems wrong is that they will also include UKIP but not the Green Party (or indeed the SNP). Although Bicycology is no longer active as a group I still check our email account once in while. At the end of December we received an email asking for feedback or support regarding the Facebook page of a group called R.E.A.L. They don’t appear to have a website but their “About” page on Facebook describes the group as a “voluntary organisation prepared to engage in peaceful direct action to address the urgency [of] fuel poverty and the impact of climate change”. I hadn’t been on Critical Mass in London since last year’s Olympic Critical Mass and with a good weather forecast for the last day of May I was quite keen to attend. I also wanted to go to a couple of events on Saturday so when a friend in Highgate asked me to have a look at her garden and offered a bed for the night I decided to make a weekend of it. On Friday afternoon I gave my fixie a good clean and packed a few things in a rucksack then caught the train to Kings Cross. I was early so I stopped off in Brunswick Square to chill out before heading down to the South Bank where a good crowd had gathered. I never normally wear a helmet but I have a GoPro camera that I wanted to try out so I had bought a basic lid and stuck one of the supplied mounts to it. When the Mass seemed nearly ready to leave I hit record and strapped it to my head, hoping it was pointing in more or less the right direction. We started out by going round the IMAX roundabout and across Waterloo Bridge before diving down into the Strand Underpass and emerging on Kingsway. After that we just basically kept going straight up Southampton Row and Eversholt Street into Camden and on to Chalk Farm. The first turn was a right onto Prince of Wales Road, at which point I decided to drop out because I was relatively close to where I would be sleeping. I pulled over and waited for a friend who only appeared after several hundred other bikes had passed. I got some reasonably good footage with the GoPro but there are lots of boring bits so if I am going to upload any of it I will have to do some serious editing first. We rode back to Camden Lock together to get something to eat at inSpiral then I said goodbye and cycled up past Kentish Town to Highgate. I got there about ten thirty and found my friend somewhat the worse for wear after an ill-advised Thursday night bender, so we just had a cup of tea before crashing out. I have a friend in the United States who has been involved in phytoplankton research for a while and spent a lot of time aboard ships sampling off Maine. 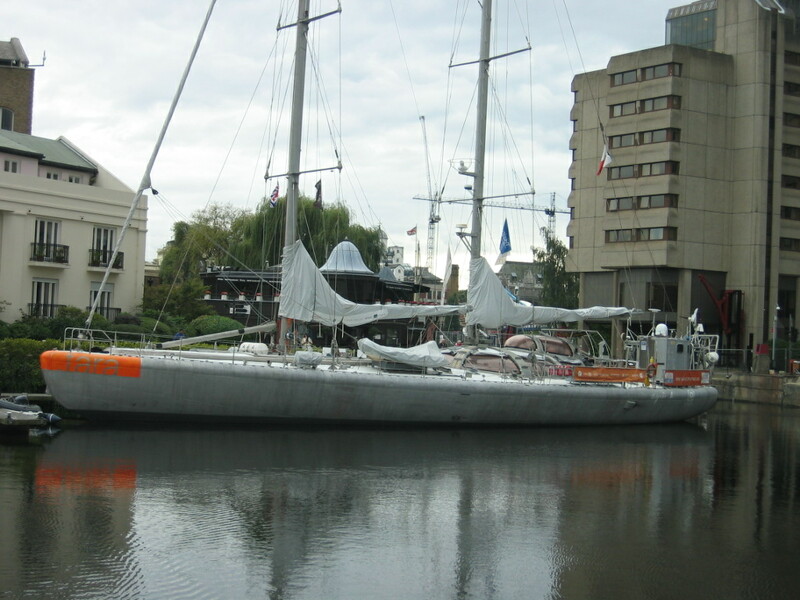 About a week ago she recommended that I visit the sailing vessel Tara, which is currently docked in London having just completed a two and a half year, 70,000 mile voyage called Tara Oceans, investigating marine ecosystems and biodiversity. Back in 2007 I was involved in setting up a radical sailing collective called Learning the Ropes. About a dozen of us put some money in a kitty and in March 2008 we bought a 22 ft Kestral called Mary for £700 which came on a mooring in Exmouth. 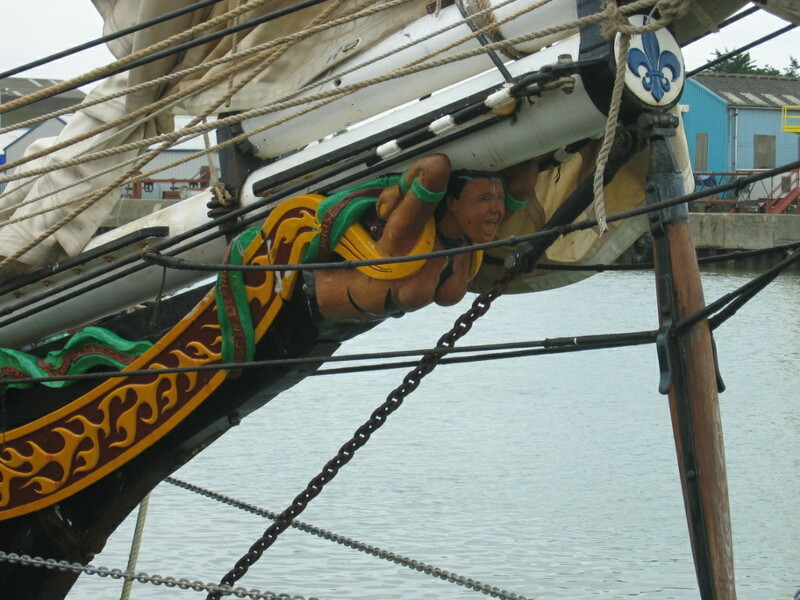 I have sailed in her three times and I reported on two of the trips in the Learning the Ropes Blog. The basic idea of the collective is to share knowledge and gain experience on a small boat with the aim of getting more people and money together to buy something much bigger which could then be used as a means of sustainable transport by the collective and a vehicle for promoting social and environmental justice. There is a lot of overlap in terms of both membership and philosophy between Learning the Ropes and Bicycology, another collective which I have been involved with since it formed in 2005. On the last weekend of July a crew of four sailed Mary down the coast to Brixham to visit the brigantine Tres Hombres. Apparently the crew of Mary were welcomed on board by the very hospitable crew of the much larger (32 m) Tres Hombres and some inspiring discussions were had about sustainable transport, lubricated no doubt by a bottle of something from the 35 ton capacity cargo hold. It is a bit of a trek to Exmouth for me and I was busy so I didn’t go but I learned that Tres Hombres would be visiting Great Yarmouth for the Maritime Festival and decided to see her there. In the meantime I enjoyed looking at these photos taken in Brixham. When I went to answer the door today there was a man in a G4S uniform standing there. The first thought that came into my mind was “what have I done wrong?” and I had a vision of being carted off to a private prison. It turned out he was only there to read my electricity meter but that used to be done by Siemens so why the change? I quickly realised that it must have been to do with the fact that I recently changed my electricity supplier. Since I was in London for the weekend anyway I decided to go to an event I had been invited to on Facebook called Come we Grow, an all-day festival about Earthships and sustainable living. 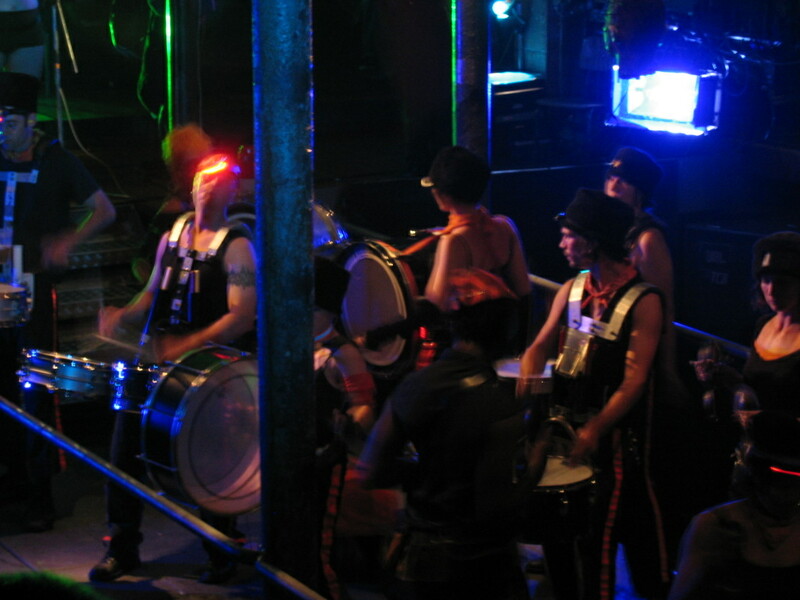 It was hosted by Concrete Jungle Earthships and May Project at a venue called InSpire, located in the crypt of St Peter’s Church near Burgess Park. I was staying at a flat in Finchley, some 12 miles distant, but I had my bike with me and was looking forward to a ride through London. I went via Finchley Road, Regents Park, Piccadilly Circus and Westminster Bridge. Somewhere near Elephant and Castle I stopped to look at the map and was passed by two gentlemen in top hat and tails riding penny farthings, which you don’t see too often. I followed them round the corner and came upon hundreds of cyclists who were obviously out on the annual Tweed Run. 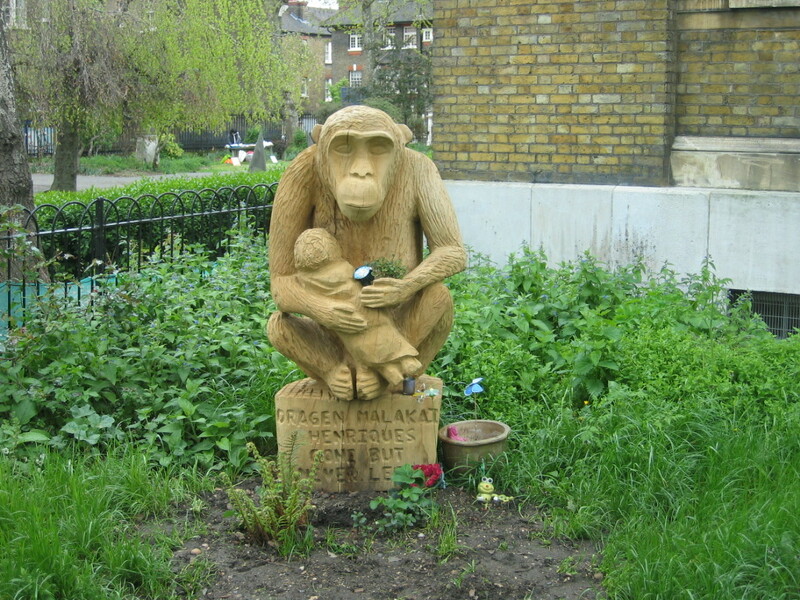 I watched them ride past, admiring the vintage bikes and outfits, before continuing on to the church where I found a lovely carving of a chimp holding a child. After locking up my bike I had a quick look round the stalls in the churchyard before heading into the crypt, where one of the first things I came across was a cardboard furniture workshop being run by a French woman called Elodie. She had a partially made cardboard chair but the workshop involved making simpler things by cutting, bending and folding corrugated cardboard and joining with masking tape. I made a cardboard cup with handle and painted it with acrylic paint and found it quite therapeutic. After that I went to a presentation in the main hall about Earthships and the Concrete Jungle project. The guy giving the talk (I don’t recall his name) had been involved with Earthship Brighton, the first Earthship to be built in England. He explained the principles and construction methods (rammed earth tyre walls are a key feature) before going on to talk about the project in London. Apparently there is an opportunity to build an Earthship in Burgess Park and the idea of the festival was to inspire people to get involved in fundraising efforts to make it happen. After the presentation I had a look round some more stalls and chatted to various people before embarking on the ride back up to Finchley. I was glad I made the effort to get there and I hope the project goes well. I wasn’t really planning to be involved with the Camp for Climate Action this year, but when the Big Green Gathering was cancelled I changed my mind and decided to go along to Climate Camp Cymru. I arrived by train in Methyr Tydfil on the Thursday and cycled up the steep hill to the camp which had already been established near Ffos-y-Fran, a huge opencast mine on Merthyr Common. There was a police car opposite each of the two entrances to the camp but they were friendly local cops who were not searching anyone or otherwise making any attempt to discourage visitors. The camp was fairly well established with about 100 people on site. I took on organising the tat tent which is where I also slept (I don’t generally take a tent to these things). By the weekend numbers had increased to about 260 and the camp was running very smoothly. I will end my report there and just refer you to a fuller account on the Bicycology blog. When I got back from Wales I spent a few days sorting stuff out and then it was time to think about the London Climate Camp. Again I wasn’t planning any major involvement but I did want to join the regular monthly London Critical Mass and I suspected it would end up at the camp so I took a sleeping bag and bought a one way ticket to London on the Friday, expecting to stay perhaps one or two nights. I knew by then that the camp had been successfully established on Blackheath and some people rode down from there with a soundsystem with the intention of leading the Mass back to the camp. That is exactly what happened and just as it was getting dark a cheer went up as about 200 cyclists pulled in to camp after struggling up Blackheath Hill. There were already a lot of people on site and I made my way to the Bicycology tent to dump my stuff and meet the rest of the crew. I am not sure how many people were on the site over the weekend but it must have been a couple of thousand. I didn’t go to many workshops or meetings but spent a lot of time networking and running the Pedals soundsystem. I also taught some bike maintenance, fixed a few bikes, explained pedal generators to a very bright young kid who was keen to build one himself, helped strip down an old blender to make a pedal powered smoothie maker etc. I also took Pedals on the kids parade round the camp with Jess Gold who lead a few songs she had taught them. After a couple of circuits the parade left the camp and made its way to Greenwich Park for a picnic. As with the Welsh Camp there seemed to be almost no police interference, which was a welcome change from the ridiculously violent and oppressive policing seen at Kingsnorth and Climate Camp in the City. It is shame Ian Tomlinson had to die to make the police back off and reluctantly grant our fundamental rights to gather and protest. In fact a police car did pull up when we started tying banners to the bandstand in Greenwich Park on the kids picnic but they called in to ask permission to intervene and were denied. Basically they were under orders to let us do whatever we wanted. The only negative thing I experienced during the camp was a run-in with Tranquility on Tuesday night. We set Pedals up in the London tent for a gig with a band called Sandweaver. We had been messed around all day with conflicting demands and we delayed the gig to accommodate a quiet acoustic band which had been rescheduled in the main marquee at short notice. So it was after eleven when Sandweaver finally got to play their set and when they finished we wanted to put on a few tunes. We knew power-down was supposed to be at midnight but it was the last night of the camp, and there was still amplified music coming from the main marquee, and we had been delayed for ages through no fault of our own, so we thought we could get away with playing for another half hour or so. About twenty past twelve a masked woman barged up to the soundsystem and demanded that it be turned off – not at the end of the track but immediately. I reached for my torch so I could look at the mixer and for some unknown reason she tried to grab it out of my hand, something which might actually be classed as assault. We shut the system down at the end of the track and it was only five minutes after the sound went off in the main marquee so I don’t know why she was so bent out of shape. I was told she was from Tranquility, which is supposed to resolve conflict – Hostility more like it. Apart from that everything was good. I stayed on Wednesday to help take down marquees etc and then did a 2am to 6am gate shift. On Thursday morning I helped dismantle the water system and then decided to cycle home to Hatfield. I went through the Greenwich foot tunnel and joined the tow path on the Lea Navigation. Somehow I got lost a couple of times and it ended up taking me about five hours to get home, sustained by nothing but foraged wild plums. I was actually coming down with a cold as well so when I finally arrived home it was all I could do to drag myself upstairs and collapse into bed.